No matter how long he held his breath, Disney was still going to charge him $12.50 for a keychain. Unfortunately, Mickey Mouse is not considered an official round by the boxing association. Warning: Do not pirate movies from Disney, they dye-pack all their properties. This picture says lot about this man. The goatee says "Mom's basement". The belly says "I.T. Development". The unpainted area around his eyes says "I cry a lot". And, the original Gameboy in his pocket says "I'm 34 and single". BOOM! Some were more upset than others than the iPad lacked a mouse. The Blue Man Group's campaign of terror against mice continues to mystify. Okay, you want Disney to go away, but dude, I wouldn't hold my breath. 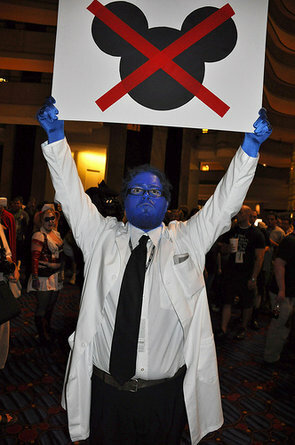 Much like my blue friend, I too am against a Triple Death-Star super-weapon. The Blue Man Group finally split up, but their new jobs weren't much better than the old. This says "John 3:16" in Venusian. Getting plastered in Japan was different than Larry had anticipated. According to the floating rapperclock, it was half past seven, yo.